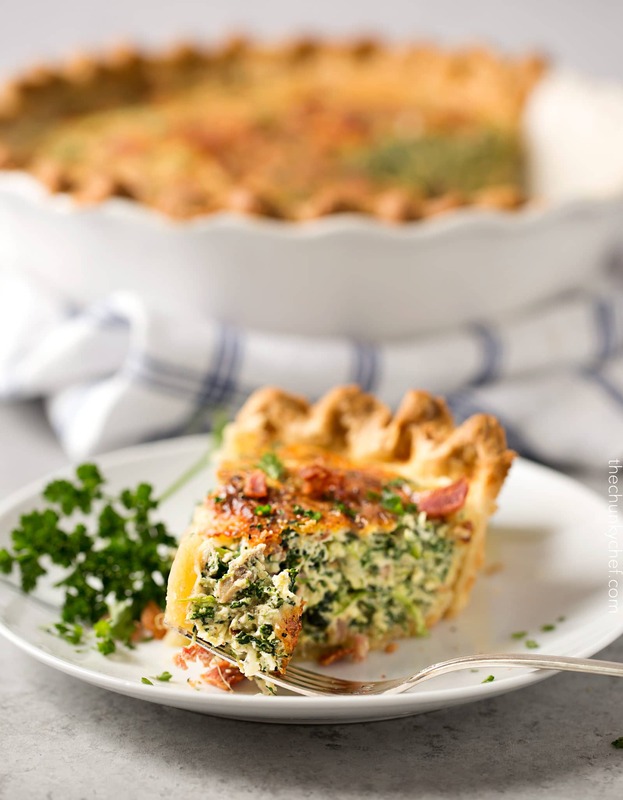 This spinach quiche is made easy by using frozen pie crust, and is filled with mouthwatering flavors like gruyere, ham, bacon, and mushrooms! Savory quiche, filled with spinach, Gruyere, caramelized onions, ham, bacon and mushrooms! 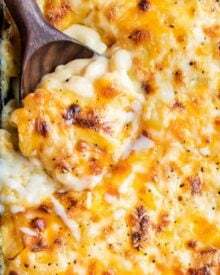 My version is made extra easy by using frozen pie crust, and most of the ingredients can be prepped ahead of time, making this a fabulous, easy meal!! 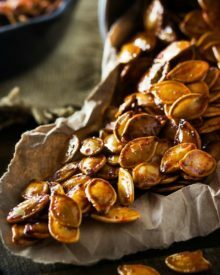 This is a recipe that I’ve been wanting to put on the blog for a while, but somehow never got around to it! My daughter calls this “egg pie”, and honestly, it cracks me UP, but she’s pretty much right. 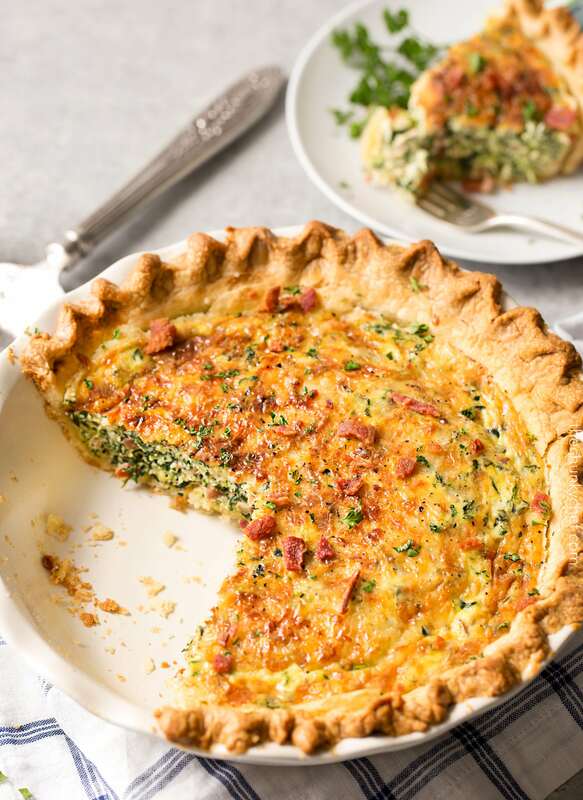 I mean a quiche is basically a savory pie, filled with an egg custard, right? 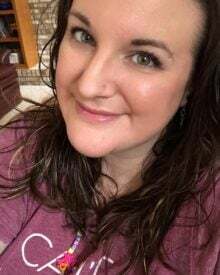 Back when she was in preschool, they were learning about food and cooking, and when the teacher asked her what her favorite meal was… you guessed it, she said “egg pie”. And of course, no one knew what she was talking about lol. 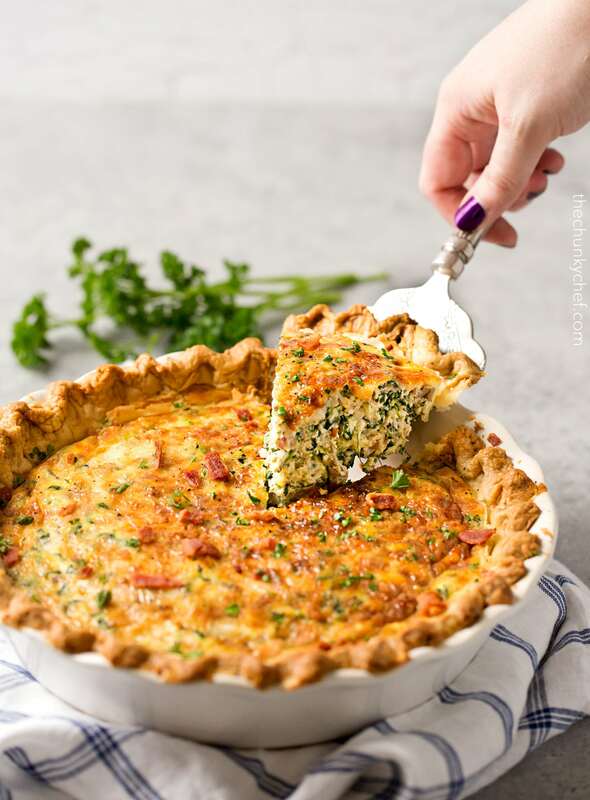 I never thought of quiche, especially spinach quiche, as being a kid-friendly recipe… but oh man, both my kids go to town on this quiche when I make it! In fact, one pie is almost not enough! Lord help me when the kids are older and eating more lol. 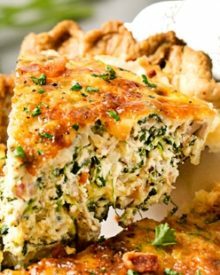 One thing I love about this recipe, is that you can pretty much use it as a method for making quiche, then add whatever fillings you like! If you do want to go for the mushrooms and spinach, make sure you press all the water out. Wet ingredients make for a wet filling, which would make for a quiche that won’t fully set. I’ve done it before, and it’s no fun! You could also use a homemade pie crust if you’d like… I just seem to have an inability to make a pretty crust. 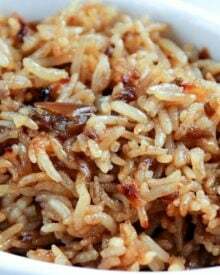 I have my great grandma’s recipe, and it’s amazing, but I don’t have the knack for it I guess lol. For me, deciding what to serve with this spinach quiche has always been difficult. 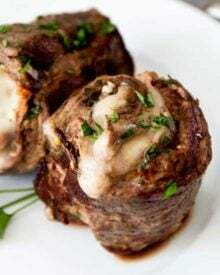 But lately I’ve been serving a quick side salad and some slow cooker ranch mushrooms, and it’s been a hit! Dice up onion and ham and caramelize. Cool and store in the refrigerator. Grate cheese and store in refrigerator. Once you have the ingredient prepped, you can get this together in about 5-10 minutes. Basically, while the spinach is defrosting, you can beat your eggs, half and half, seasonings, add in ham, onions, bacon, cheese, and chopped mushrooms. Then just squeeze the excess water from the spinach and stir it into the egg mixture. Pour it into the frozen crust and bake. 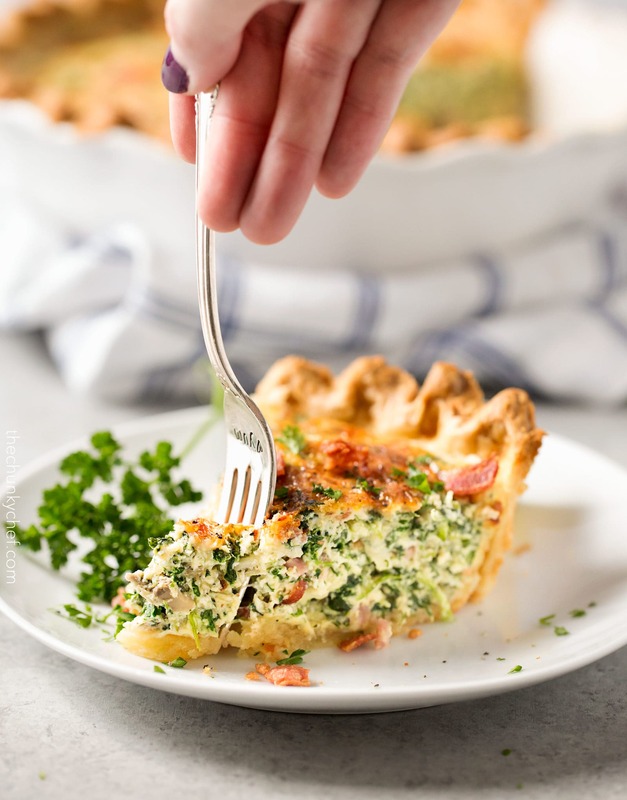 I hope you guys make this Basic Cheesy Spinach Quiche with Bacon soon! Preheat oven to 375 degrees F. To a medium skillet, add butter and heat over MED/MED-HIGH heat. Add onions and ham, saute for 5 minutes, stirring occasionally, until edges are deeply caramelized and golden. Remove from heat and set aside. Cook bacon, then crumble and set aside. Place open box of frozen spinach on a microwave safe plate, pour 2 tsp of water on frozen spinach, close lid and microwave for 6 minutes. Transfer defrosted spinach to a mesh sieve or colander. Let cool for a few minutes, then press with several paper towels and press to remove excess moisture. To a medium mixing bowl, add eggs, and half and half and whisk to combine. Add salt, pepper, nutmeg, onions, ham, bacon, and spinach. Stir to combine. Add chopped mushrooms to same sieve or colander you used for the spinach, and press with paper towels to remove excess moisture. Stir mushrooms and 1 cup shredded cheese into the egg mixture. Remove frozen pie crust from freezer and transfer egg mixture to pie crust. It will be very full, and depending on your pie crust, all the mixture may not fit. Good news is, the mixture can be used to make a fabulous egg scramble! Sprinkle top with remaining 1/3 cup shredded cheese. Bake quiche for 40-45 minutes, until top is golden brown and center is set. Remove from oven and let rest for 5 minutes or so. 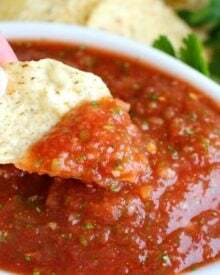 Cut into 8 wedges and serve. Sprinkle with parsley if desired. This is the third time I have made this Quiche! Absolutely our favorite! I never tried quiche, thought it was too hard. I like the suggestion to have everything done the day before! How much fresh spinach instead of frozen ? Will you be cooking it down in the skillet? If so, I would say to use a half a pound of spinach. I love this quiche. 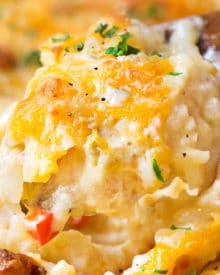 I’ve attempted quiche before but it always ends up too runny, however this recipe was perfect. I am definitely making this again! I haven’t tasted it yet, but it looks so Good! I used vegan bacon and no ham since I’m a vegetarian, just fried up the “bacon” with the onions and once caramelized I also added the mushrooms for a little bit. I made this quiche and it was excellent. Took it to work for a brunch meeting, it disappeared so fast and I couldn’t offer a second helping. Next time I’ll have to make two. 😁 Thank you. Can low fat milk be substituted for half and half? Hi Claire, I’ve never tried that, as we love the creaminess of the half and half, so I can’t say for certain if that substitution would work well or not. I made this for Christmas breakfast. Mixed all together except the bacon the day before exactly according to the recipe. I prepared the bacon and kept it cold. I stored the mix in the fridge overnight. Christmas morning I added bacon, stirred and poured into shells. Fabulous! Now my family wants it again for New Years morning. And they’re getting it! Hi Lauren, it’s listed right there in the ingredients… half and half is part cream, part milk, and it’s found in the dairy section of the grocery store. I don’t know how my family will react when I’m going to tell them that I’m preparing a pie with gruyere, ham, bacon and mushrooms, but, hopefully, the will like it. Yes, you guessed it, this is the recipe I’m preparing for Friday night. I really hope that the cheesy part will make it even attractive, since they’re all big cheese fans! Can you freeze this quiche? Hi Joanne 🙂 I never have, but I’m sure you could! Want to make this! Just wondered – in the list of ingredients it says 1/2 of a 10 oz. box of frozen spinach, is that right? Or do you use the whole 10 oz. box? Thank you! 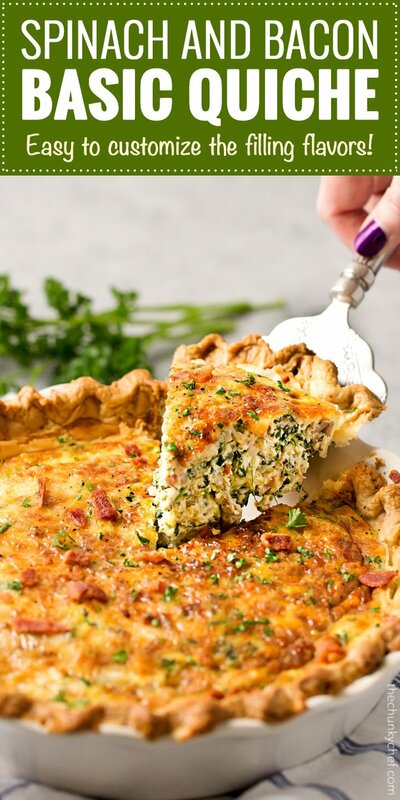 Yup, definitely need this in my life, I am OBSESSED with quiche and this is the prettiest one I’ve ever laid eyes on!!! WHEW!!!!! Looks like a super delicious, loaded quiche! 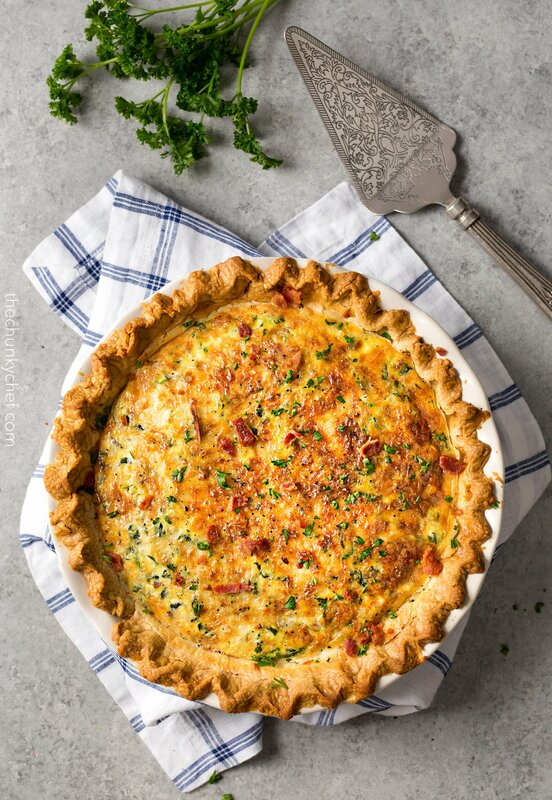 This quiche looks gorgeous and sounds absolutely delicious! I have not been bale to make quiches in for ever. Your version looks fabulous! This would be amazing for Easter brunch. It’s gorgeous! Oh my. This looks so good! It’s been ages since my last quiche! This looks so yummy!! 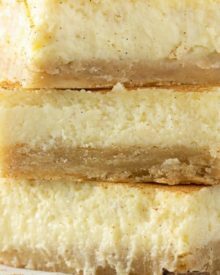 This goes to my must try recipes! Thank you for sharing this! Love it!